EXCLUSIVE REVIEW: Panasonic's SC-BT100 Blu-ray system | What Hi-Fi? 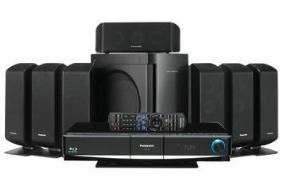 Panasonic is the latest to join in, with a three-model range based around its SC-BT100 system: a 3.1 model for £700, a 5.1 version for £850 and the flagship 7.1 system with wireless rear speakers for £1000. All three include a built-in iPod dock. We've just got our hands on the 7.1 model and have spent the last week putting it through its paces in our test rooms. There's no doubt it's pretty handy with Blu-ray discs, but how does it stack up as an all-round system? You're about to find out, as we've just posted the entire review here.